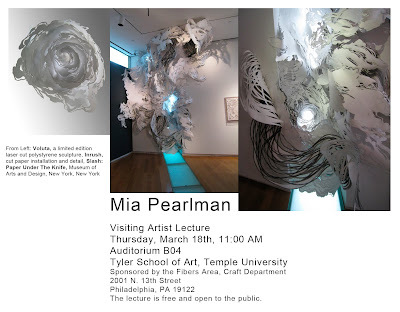 Tyler School of Art Grads: Mia Pearlman, Visiting Artist Lecture, Thursday, March 18th, 11:00 AM, Auditorium B04. Mia Pearlman, Visiting Artist Lecture, Thursday, March 18th, 11:00 AM, Auditorium B04. The Fibers Area is sponsoring a visiting artist lecture by Mia Pearlman, this Thursday, March 18th at 11:00AM in Auditorium B04. Since receiving her BFA from Cornell University in 1996, Mia Pearlman has exhibited internationally in numerous galleries, non-profit spaces and museums, including the Museum of Arts and Design (NY), the Montgomery Museum of Art (AL), the Centre for Recent Drawing (London), and Mixed Greens (NY). Upcoming shows include the Indianapolis Museum of Art and Plaatsmaken in the Netherlands. Her work is featured in several books on the use of paper in contemporary art. Pearlman has participated in many residency programs, including Proyecto’Ace in Buenos Aires, the Lower East Side Printshop in NYC, and the Vermont Studio Center. 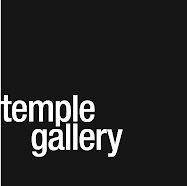 She is a recipient of a 2008 Pollock-Krasner Foundation Grant and a 2009 Established Artist Fellowship from UrbanGlass. Pearlman lives and works in Brooklyn, NY.